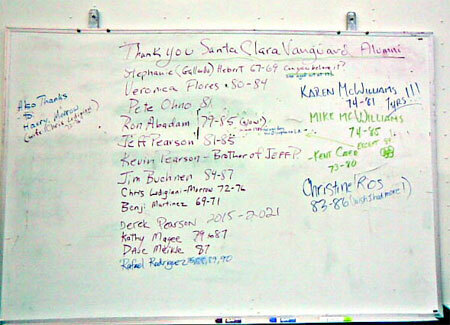 A white-board attached to the mobile kitchen, fondly dubbed "Miss Amana," boasted names of Santa Clara Vanguard alums underneath a colorful "thank you." On Friday, May 30 at Mission College in Santa Clara, Calif., the "A" corps was hard at work munching on pizza provided by their generous alumni. Grouped by section, the members enjoyed the leisurely pre-dusk down time. Some tossed footballs, while others favored baseball. A few brass section veterans had given up their break to perform for bingo regulars at the SCV corps hall a few miles away, then rushed back to catch the tail end of dinner. Among them was 20-year old Dolfo Picanco, a third-year euphonium player nicknamed "Historian." "Well, SCV historian is just something the other members came up with since I know so much about SCV history," Dolfo explained. "It's pretty much as simple as that. Ask me a question or story, and chances are I'll know the answer or have an old one to tell you." Born and raised in Los Banos, Calif., Dolfo marched as a member of Fever in 2004-2005 before making Santa Clara Vanguard his corps in 2006. "The first time I ever saw a drum corps was on videos my high school band director would play for us. It seemed interesting to me to watch marching bands look and sound so good. (At least that's what I thought they were at the time). But I actually marched in a drum corps show before I ever saw a live performance, the first live performance I ever saw was SCV '04 in Stockton." Reminiscing, Dolfo recalled what drew him to Vanguard. "It was the way SCV performed. With shows like the late '90s, seeing pure raw energy coming off my TV screen. The first time I saw the '99 show, I couldn't stop watching. I watched that show at least five times in a row and knew SCV is where I needed to be." "I also remember when I saw '89 SCV for the first time. I was in awe watching something so intense, so powerful and so emotional. As I realized that I was only watching a video, it was hard to imagine how it must have felt to see that show live." Little did Dolfo know that in the crowd that night was Rafael Rodriguez, lead soprano player for that "Phantom of the Opera" program. Rafael talked about '89 with clarity. "There was something magical about that year," he said. "And even now, people seem to feel it as it made the top of the list for past DCI Classic Countdown theater events." As the evening wore on, typical for most corps, the drummers kept up their chops even during the break. Fourth-year snare member Catherina 'Cat' Bhagwat, 21, jammed with fellow second-year snares Kevin Geis, 21 and Nathan Medina, 19 while battery caption head Murray Gusseck looked on. Guard captain Samia Mooney, a 22-year old with six years as a member of SCV, commiserated with 16-year old Paisley Parker who is in her second-year with the corps. The two ladies appeared exceptionally chipper, ignoring recent injuries and the unseasonably chilly 50-degree weather to talk about the upcoming DCI Summer Tour. In the distance, many noticed a slick car entering the parking lot. 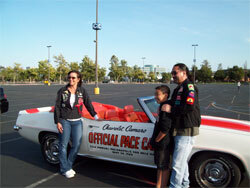 The Kono family consisting of Kevin ('82-83, '85), Roxanne ('82, '85) and son Daniel (11-years) had pulled up in a white, orange-detailed Camaro with door-writing indicating it was an Indianapolis pace car from 1969. Given where the championships were to be held this year, it seemed appropriate. With "Miss Amana" closed-up, the corps began assembling. They knew the pizza and subsequent ice cream cones came at a price. 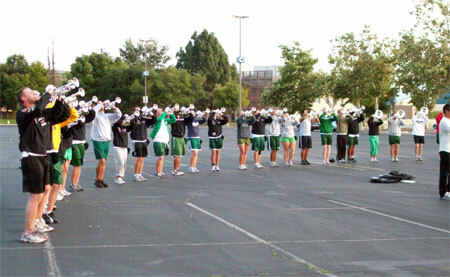 The nearly 40 Vanguard alums were there to hear the Vanguard "A" corps perform sections of their 2008 show. As the audience lined up behind the drum major podium, musicians filled in behind the pit with the guard to the left. "Age-out" drum major Travis Roach introduced the corps, their show "3HREE", and the movements they would perform that night: "Mind" and "Body." 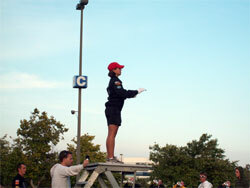 For encores, new drum major Stephanie Lee conducted SCV's traditional "Bottle Dance" from "Fiddler on the Roof" while Roach wrapped up the night with the corps' signature, "Send in the Clowns." "'Clowns' will always be incredibly special, because it always reminds me of my SCV family," Lee said. Our 'traditions may have changed a bit over the years, but SCV has always been a family. Most importantly, I am now a part of that SCV family, and that is something I will always treasure." A Georgia native, Lee just finished her third year as a music education major at the University of North Texas. She joined SCV last year as a trumpet player, and she is only the second female drum major in SCV history next to Becky Shultz ('98). "Last night was a lot of fun," Lee explained. "It's always great to meet our alums and talk with them about the great shows they were a part of that created the SCV we have today. I thought the performance went really well. It really showed how hard everyone has been working these first two weeks of the summer." "It's always a lot of fun performing for alumni," Dolfo continued. "Seeing a crowd of people wear the SCV corps jacket, knowing that they are always our biggest fans, supports, and critics. That they were the generations before us that set down the traditions we go by." As the historian, he couldn't resist to add, "And it's always fun to sit down with people who marched 20 years before you and hear their stories." When applause capped the last note of the performance, director Jeff Pearson pulled the corps in and invited the alums to join them. There, he re-introduced new CEO, Jeff Fiedler. It was a good night for socializing, and a great night for drum corps. Photos by SCV alumni Ben Martinez and Rafael Rodriguez.